I found an article on Sean Fagan's RL1908 website about the origins of club names and colours. I've included the intro and the bit about North Sydney below. After that, I've included a few paras from the History page of the Northern Suburbs Rugby Club. Research for The Rugby Rebellion revealed some interesting new material in regard to the nicknames and colours of Sydney premiership clubs. The book did not offer the opportunity to discuss these findings, and they are shared here for the first time. The full story of the origins of club colours and nicknames is still far from settled - but some new findings and theories can be added to what we already know. Uncovering the 'truth' is an ongoing process - what follows will hopefully offer some possible sources that can be fully investigated by those that are inspired enough to seek out the answers. It is important to remember that much of what follows hereunder is speculation - the purpose of this article is share what is known, and offer suggestions of what may be the truth, and what ought to be investigated further. What is clear is that direct lineage to the social-based Sydney first grade rugby union clubs of the 1890s continue in the jersey colours of some NRL clubs (present and past) and Premier League clubs - namely Paddington (Sydney Roosters), and Pirates/Wallaroos (Wests Tigers, Balmain, North Sydney and Northern Eagles). It can also be speculated that 'rabbitohs' and 'roosters' - both very unusual names for football clubs - may have very Australian origins. The 'Shoremen' was originally a name given to the black-jerseyed Pirates club in the 1890s. Some have suggested that when Norths rugby union club was founded in 1900, the Pirates were directly responsible for forming the club, and that they are, in effect, the same club. This is not correct. In early 1900 the Pirates held a meeting and disbanded. Examination of the names of players and officials recorded at the founding meeting of Norths RU (held around the same time as Pirates demise) showed just as many came from the Wallaroos as the Pirates. Former Wallaroos included the powerful Arnold brothers (Richard and Monty) who effectively controlled Australian rugby. It is therefore no surprise that North Sydney adopted their red and black colours from the Wallaroos (who wore black, gold and red jerseys). The use of black also satisfied the ex-Pirates. The 'Shoremen' name did transfer from the Pirates to Norths, but this is most likely due to both clubs having been based on the northern shore of the harbour, black still being in the jersey, and having to travel across by boat to play away matches. The Original Club Rugby on the lower North Shore is over 130 years old. Council minutes reveal that the North Shore Football Club played on a paddock adjoining Holterman's Tower, what is now the Shore School. The club later transferred to St Leonard's Park and became known as the Pirates, a mighty team which won the First Grade Premiership in 1898 and the R.A.S. Trophy in 1897/8/9 by defeating the neighbouring Wallaroos 10-nil in the third final. The Pirates and Wallaroos combined in 1900 to form North Sydney. It was the first district club to affiliate with the metropolitan Rugby Union in the initial eight-club district competition. The date was April 5, ahead of Wests on April 11 and Easts on April 12. Jim Henderson, commemorated in the present Premiership trophies for Third and Fourth grades, was North's first secretary, and the club's first cap was winger Charlie White, who played in the first ever Test in 1899 against the British Isles and then in the first Australia V New Zealand test in 1903. The club did not win any premierships prior to the 1914-18 war, but before competitions were suspended, its name was changed to Northern Suburbs. However, for reasons today unknown, the new name was not implemented until the 1928 season. Re- the comment that North Sydney (as it was then called) "was the first district club to affiliate with the metropolitan Rugby Union", North Sydney was also the first club to affiliate with the NSW Rugby Football League. Interesting post I have come across a 1907 team photo of norths I can only assume at the moment that this is the norths RU alot of the players in the photo become the nucleus of the norths rugby league team including eklund devereux lutge whitfield etc this is one of teams that played for norths ru in1907 W.Whitfield,F.E.Humphries,H.Fitzpatrick,J.Devereux.I.G.Mcintosh,R.Warne.l.Morris.P.Casey.G.Gardner.D.lutge.capt.J.Abercrombie.P.Boland.H.Glanville.J.Coste(a).EBoland. This was just one team that played during the season but others who played for that first rugby league side fir norths come from other union clubs as well . ie F.Notting Manly club.W.McCarthy Sydney club.A.Sprouster played with the north suburbs club A.Bollard also from.The norths ru club .A.Morton from the manly club and E Courtney not sure if the same one with us but with the St George union club.there was also a H Bullock from the Uni club. I know it is only little- but here is a small report on a match from this year I found. 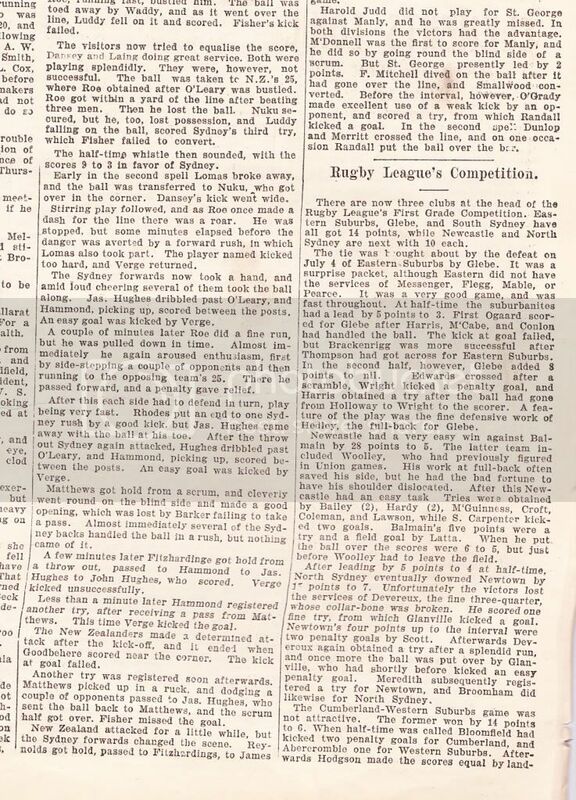 very rare to find something from 1908.
interesting to know if Bailey who played for Newcastle was the same Bailey who played for us a couple of years later.